Head Over Heals - Sit, Stand and Sleep to Heal Yourself! Are you a chronic pain sufferer who has wasted thousands of dollars on prescription drugs, surgeries and/or therapy, yet you still can’t seem to get rid of that mysterious pain? Learn the secrets to natural and instant pain relief that can improve your health, reverse signs of aging and prevent injury. Head Over Heals is designed to help people (like you!) who suffer from a mysterious pain in their bad shoulder, hip, back, knee, ankle or joint. By gaining a better understanding of how the body should work and using our simple tips and “good habits” every day, you can finally live a pain-free life! So, go ahead – live your life pain-free. We dare you. Commit to it, achieve it, live it! People of all ages suffer from chronic pain. Starting at the age of 12, your body starts to show evidence of gravity working against it. So, if you have bad habits like rolling your shoulders forward, protruding your neck or tilting your pelvis, these bad habits will catch up to you and cause pain. Who can benefit from Head Over Heals? 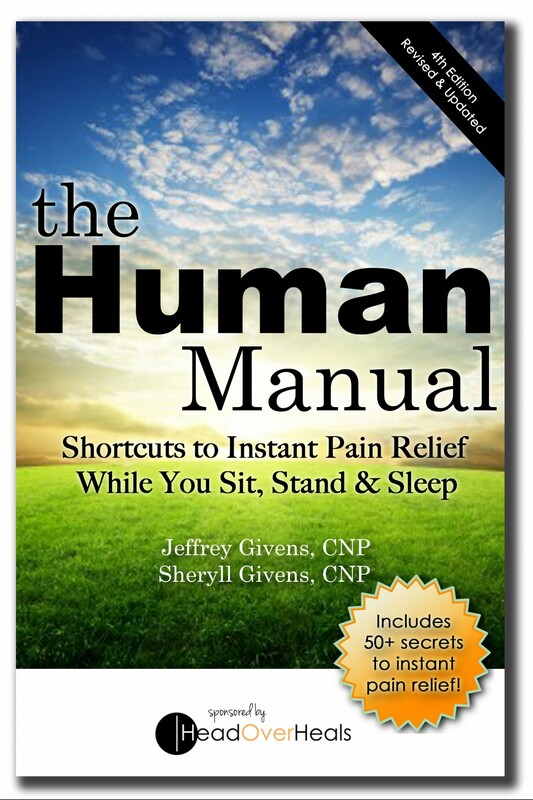 Find our book, The Human Manual along with many other recommended books and tools in our store! Great site! Thanks for the helpful info!